CMST Brass team deliver tuition on a wide spectrum of brass instruments including Trumpet, Cornet, Trombone, French horn, Tenor horn, Baritone, Euphonium and Tuba. The Brass family has instruments that feature in all ensembles so you will always be in demand when playing one of these fantastic instruments. Combining the most significant elements of the classical and popular tradition our common aim is to produce a good guitarist who is also a well-rounded musician. Singing and song-writing are strongly encouraged and established students can diversify to include the myriad guitar styles in their repertoire including jazz, folk, classical, rock and pop. The keyboard team are able to teach both electronic keyboard and piano in individual, small group and larger ensemble lessons. A mixture of traditional and popular music is used, and improvisation and composition are also included. External examinations in all styles are possible at all ages, and ensemble membership is encouraged. 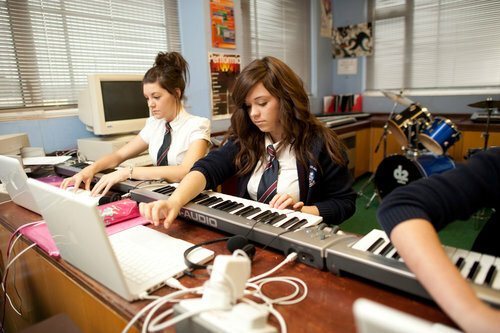 Music technology can provide an engaging way to deliver the curriculum. The emphasis is on teaching music using technology, rather than on the technology itself. The musical tools (from free music websites/software through to iPads or sound recorders) are used to develop skills in composition, performance, and an understanding of music. The Percussion Team places equal emphasis on breadth of musicianship alongside enjoyment in learning. The team encompasses specialists in drum kit, Latin-American, timpani and orchestral percussion (both tuned and unpitched), and World Music such as Taiko, Samba, African and Steel Pans. We offer a broad curriculum from early music and baroque through pop, jazz, chamber, symphonic and theatre music to present day contemporary percussion repertoire. Our string teaching in violin, viola, ‘cello and doublebass promotes the highest standards at all levels, encouraging the exchange of ideas and creating a warm and caring environment for our pupils conducive to learning. Teaching and learning should be fun; that’s the first most important thing. All our teachers will plan and structure their lessons to give as many different learning opportunities as possible. Vocal tuition includes the full spectrum of genres from classical, folk and musical theatre through to rock and pop. Our teachers ensure pupils are aware of vocal health working with them to develop an understanding of the importance of warming up the voice in preparation for singing. Pupils may enter examinations in their chosen specialism and learners are encouraged to take part regularly in performances. Our highly skilled woodwind team offer tuition on all the orchestral woodwind family – Flute, Oboe, Clarinet, Bassoon and Saxophone. CMST staff also teach Recorder and Fife. CMST staff will help you discover and play all kinds of music. Our teachers will ensure your musical journey is filled with fun with performing opportunities and we will encourage you to join an ensemble as soon as you can! CMST teachers can help you prepare for examinations and festivals. The transformational power of music can develop a wealth of skills when whole classes, teachers and a music specialist work towards a common musical goal. Most importantly, all pupils are given the opportunity to play and perform. CMST teachers deliver whole class instrumental and vocal tuition. Schools will need to provide class sets of instruments and class teachers learn alongside their pupils. Cornwall Music Education Hub First Access scheme (instrumental teaching for one term for students who have previously not received it) can be delivered on behalf of the CMEH.